A history of the Superbowls Around the World concept, and a listing of all the places that I have watched America's biggest and best export. 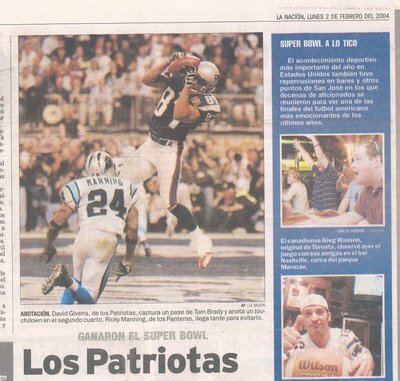 I was sitting in a bar in San Jose, Costa Rica in 2004, getting ready to watch the Superbowl, when I suddenly realized that in the past 4 years I had watched the Superbowl in 4 different countries. Because I am a bit of an idiot, I decided to make this a bit of a mission of mine. I planned to try and watch the Superbowl in a new country every year. In 2005 I actually planned to be in Tanzania in January just so I could keep up the streak. From 2006, though, the entire concept fell apart as it became had to get enough time off to actually get to another country for the Superbowl weekend, and in 2008 I declared the entire undertaking dead. However, with my move to the United Kingdom in 2008, it means that Assignment Superbowls Around the World is back on again! Here is the list of all entries associated with my Superbowl Mission. 2016: Superbowl 50 in Borough, London, England at Roxy's Bar and Screen. 2015: Superbowl 49 in Hammersmith, London, England at Belushi's. Pics, pics, pics and silly twitter statuses abound. 2014: Superbowl 48 in Etobicoke, Canada at Wingporium with good friends, cold beer and hot chicken wings. 2011: Superbowl 45 in Munich, Germany at the Kultfabrik, in a party hosted by the GFL's Munich Cowboys. 2009: Superbowl 43 in London, England at an American expat event in Islington on the snowiest day in 18 years. 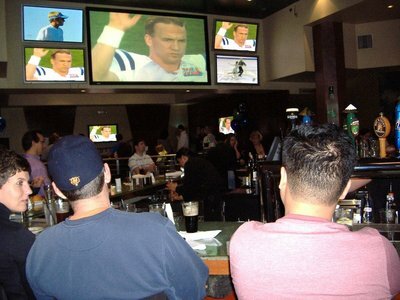 2008: Superbowl 42 in Toronto, which I didn't bother to write a separate entry about, but rather included in an entry on watching a hockey game in Montreal, Quebec, where I declared the concept dead. From the San Jose paper - they spelt my name incorrectly, but that's me cheering along. I shall keep this entry update with the latest, as my mission progresses.